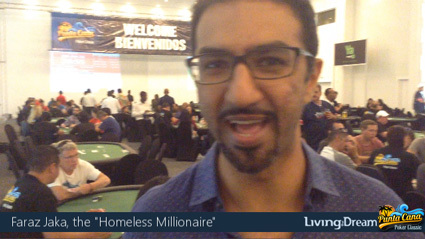 One of the most interesting players we've met at the Punta Cana Poker Classic is Faraz Jaka, nicknamed the Homeless Millionaire by CNN. 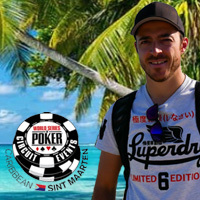 He's a professional poker player who's really living the dream. He’s travelling the world from tournament to tournament so much that he gave up his home entirely years ago. Now, even with more that $8 million in career earnings, he lives from a suitcase with just the essentials: a few pieces of clothing and a laptop. Sounds great. But is there's got to be a catch, doesn't there? “I obviously love being on the road. That’s why I do it, but there’s definitely some things that you wish you had. It can get frustrating sometimes." I asked him what advice he’d give a some he said to just be careful about getting caught up in the jet set poker lifestyle. First class flights… fancy restaurants… five star hotels… If you want to last, better to stay grounded. Apparently Twitch poker guru Doug Polk hadn’t heard that advice! After indulging in the lifestyle the night before he slept through the first three levels of Day 2! Neither of these pros made it to the Final Table, but they’ll be there to cheer them on and to see who walks away with nearly $150 grand. If These Guys Can Do It, So Can You!